Unidentified Flying Objects, or UFOs as they are commonly known, have been witnessed by millions of people all over the world and have been recorded in history books, myths, legends and traditions for thousands of years. However, many accounts that are recorded in ancient texts are dismissed as mere myths and legends, while UFO sightings that have taken place in the last few centuries have been classified as misinterpretations of natural phenomena, illusions, or conspiracy theories. History has shown us time and again that a plethora of so-called ‘myths’ have their basis in reality. It is possible, and indeed likely, that stories and legends were a way for people to explain real—and perhaps perplexing—events using the knowledge and beliefs of their time. In support of this theory, a number of events described in mythology, which were once considered mere fairy tales, have now been proven through archaeology to have existed. A famous example is the city Troy, which is central to Homer’s ‘The Iliad’. Long considered to be a city of myth, Heinrich Schliemann’s discovery of the actual site in 1868 elevated it to a place in history. Nevertheless, the remainder of The Iliad is still viewed as a myth and fantasy without any serious attempts being made to investigate whether or not there may be more truth behind the tale. The same goes for many accounts of ‘flying machines’, which we find reference to in countless mythologies from numerous different cultures around the world. It is common to see people selectively decide what is real and what is not and all of this on the unsubstantiated assumption that ancient people were primitive and had little to no knowledge compared to us today. On the contrary, many ancient civilizations, like the Sumerians, Indus Valley, and Egyptians existed with complex social structures, legal systems, art, astronomy, mathematics, and technology, some of which is still not fully understood today. The Antikythera Mechanism, for example, is a 2,200-year-old mechanical device that is still not completely understood despite decades of research by top scientists around the world. The topic of flying objects and supernatural beings from out of our world is one in which we find multiple references in mythologies. All of these myths and legends, along with archaeological evidence such as rock art depictions, have created a wave of theories that gave birth to the ‘Ancient Astronaut’ perspective, which links all of these ancient references and depictions to UFOs, and posits that extra-terrestrials visited Earth and made contact with humans in antiquity and prehistory, influencing the development of human cultures, technologies, and religions. Unfortunately, there are numerous charlatans who have tried to ‘cash in’ on this movement for profit or publicity, or who have diminished it with caricatures of little green men, resulting in the ancient astronaut perspective being widely criticized and attacked for its lack of credibility. Consequently, what is in fact a plausible and possible explanation for what we see in ancient art and texts, is now rarely examined by scholars, who fear being ridiculed or having their professional career seriously undermined. But let’s leave the ancient past for a while and examine just the last 80 years of human history. Millions of people all over the globe have witnessed unidentified flying objects. Many have been recorded in detailed reports witnessed by police, pilots, astronauts, government officials, pilots, military personnel and, of course, ordinary citizens. Some of the more well-known cases were witnessed by thousands of people at one time. Historical records make it evident that UFO appearances magnified during and after World War II, including the example of the famous ‘Foo Fighters’. While most sightings can be explained either by celestial phenomena, airplanes, planets, weather phenomena, military exercises, or in some cases drug use or mental instability, there still exists a small percentage that cannot be accounted for by any of these explanations. 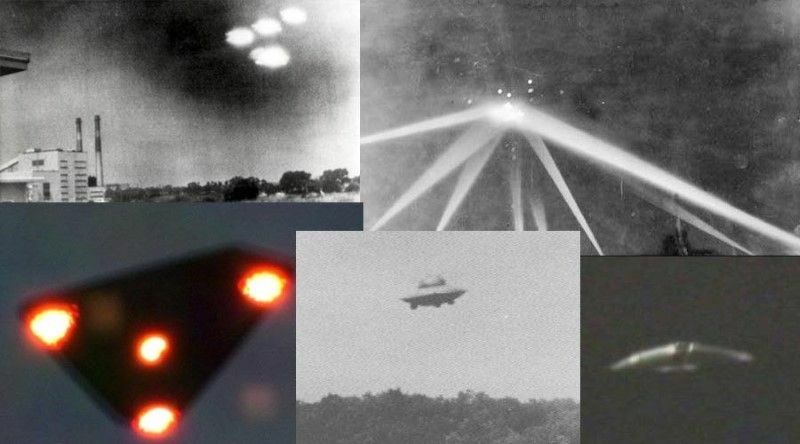 This is what makes the phenomena important and not to be ignored, particularly considering that sightings are frequently reported around military bases and airfields and are therefore, at the very least, a matter of both national security and air safety. It is an undeniable fact that there are cases of unidentified objects in our skies. It has been acknowledged by the major governments from all over the world simply through the very fact that official research has been conducted on the matter in the US, UK, Russia, Europe, China, South America, and many others. All of this research, in every single case, concluded that there is a percentage of phenomena that cannot be explained. In the past decade, many countries have declassified their UFO research files, releasing thousands of documents through the Freedom of Information Act and making numerous UFO cases available in the public domain. One recently released document from the UFO files in Britain, revealed how Churchill, concerned about the UFO issue, ordered a shutdown of information for at least 50 years to prevent mass panic and the potential to undermine religious beliefs. The document in question was also published on the BBC news site in 2010. By doing careful research on the topic, passing over obvious scam and fake stories, it is clear to see that unidentified flying objects do exist. So the question is not whether they exist or not, but rather, what are they? Are they of terrestrial or extra-terrestrial origin? And what is their purpose? We know everything about physics and reality and therefore there is no way that such distant travel can be achieved. We are using our means to try to contact other civilizations (e.g. SETI’s attempts to pick up radio or communication signals) and since we don’t perceive any signals of OUR type, nothing must exist. We are looking for organic forms of life exactly like us and for planets with the exact same conditions as ours. It is clear that these arguments show the arrogance of mankind, a mankind that may just be an infant in the Universe. And this is not new. During the history of humanity, in every single period of time, we believed that we knew the truth, only to have it replaced later on by new ‘knowledge’. Quantum physics, still a relatively new and unexplored field in Science, has shown that reality could be completely different to what we believe it to be. Powerful telescopes have shown distant planets in solar systems that could possibly sustain life. Theories of wormholes and warp drives have shown that at a theoretical level we could achieve interstellar travel. Yes, we would require incredible amounts of energy to even think of trying to achieve something like this, so according to our standards today it is impossible to achieve, but in theory it can be achieved. The reason that the scientific community is not dealing seriously with UFOs is because the topic has been extensively ridiculed both by the media and in academic circles, with false information spread everywhere. For similar reasons, military personnel, astronauts, pilots, and other categories of professionals do not want to talk because, either they have been forced to sign confidentiality agreements, or because of fear that their careers would be destroyed. This is why we have seen many examples of ‘death bed confessions’. One such case was with astronaut Gordon Cooper, who told the world about his experience encountering a UFO during his flight in the Mercury capsule in 1963. Before he died he stated: “for many years I have lived with a secret, in a secrecy imposed on all specialists in astronautics. I can now reveal that every day, in the USA, our radar instruments capture objects of form and composition unknown to us”. While great efforts have been made to ridicule and disparage anyone who lends support to the existence of UFOs, the fact remains that there are numerous high-profile cases that are supported by solid evidence, and which should not be dismissed. Below I present a very limited list constituting strong evidence for the existence of unidentified flying objects in the last 60 years. It all happened in the early hours of February 25 in 1942. An aircraft flew over LA County that sparked an air raid alert (it was in the midst of WWII). Searchlights and guns were locked onto the aircraft for about an hour. The picture below appeared in the LA Times in a story about the Battle of LA It clearly shows a night time defensive response to an air raid. The aircraft was not hostile and obviously was not damaged by the attack. The Government stated that the craft they were shooting at was unidentified. This incident involved a group of American servicemen stationed at a military base in Suffolk that contained a storage centre with nuclear weapons. There had been three consecutive night of sighting objects in the sky over the base, in some cases shining a light down upon the nuclear weapons storage. On the third night, approximately two dozen servicemen were sent into the forest to investigate one set of mysterious lights. The men reported seeing a spacecraft on the ground in close proximity to them and three extra-terrestrial beings. One serviceman claimed to have touched the craft. The whole incident was filmed and photographed by one of the servicemen, but all photos and videos were removed by the US military. When the British Government released the UFO files, the Rendlesham incident papers were missing – as reported on BBC. In November, 1986, a Japanese crew of a jumbo freighter aircraft witnessed three enormous unidentified objects while flying over Alaska, USA. This sighting gained international attention when the Federal Aviation Administration (FAA) announced that it was going to officially investigate this sighting because the Air Route Traffic Control Center in Anchorage, Alaska, had reported that the UFO had been detected on radar. The UFOs in this case were tracked on both ground and airborne radar, witnessed by experienced airline pilots, and confirmed by a FAA Division Chief. The Belgium UFO wave began in November 1989. The events of 29 November would be documented by no less than thirty different groups of witnesses, and three separate groups of police officers. All of the reports related to a large object flying at low altitude. The craft was of a flat, triangular shape, with lights underneath. This giant craft did not make a sound as it slowly moved across the landscape of Belgium. The Belgium UFO wave peaked with events on the night of 30/31 March 1990. On that night, unknown objects were tracked on radar, chased by two Belgian Air Force F16s, photographed, and were sighted by an estimated 13,500 people on the ground – 2,600 of whom filed written statements describing in detail what they had seen. Following the incident, the Belgian air force released a report detailing the events of that night. On the night of August 30, a cluster of multi-colored lights was seen floating in the sky above Osaka. Several people reported to Twitter that they saw a group of lights forming a triangular shape and flashing green, red and white in the night sky above Izumi city in Osaka Prefecture. The sightings caused a commotion on Twitter after one user wrote: “Everyone in Osaka, go outside! There’s a UFO!” prompting others to grab their cameras and snap up photos of mysterious luminous object. At approximately 16:15 CST on Tuesday November 7, 2006, federal authorities at Chicago O’Hare International Airport received a report that a group of twelve airport employees were witnessing a metallic, saucer-shaped craft hovering over Gate C-17. The object was first spotted by a ramp employee who was pushing back United Airlines Flight 446, which was departing Chicago for Charlotte, North Carolina. The employee apprised Flight 446’s crew of the object above their aircraft. It is believed that both the pilot and co-pilot also witnessed the object. The incident took place on May 2007 at 14.00 local time in Lima Peru. A series of moving lights resembling an armada of flying objects appeared in the skies. The story was reported on the news and was seen by thousands of people. Many would say that the above examples constitute irrefutable proof that extra-terrestrial UFOs exist. So why isn’t the public told about it? Imagine the implications that disclosure would have and what it would mean. Acknowledgment of extraterrestrial civilizations having visited Earth would mean that many of the myths and legends of the past are in fact based on reality. It would suggests that humanity has been influenced for millennia by otherworldly beings, beings that in the past were considered gods. Disclosure would entirely topple the status quo and the balance of powers in society, and turn upside down what we know about the history of mankind. The acknowledgement of the UFO phenomena is an event with the power to bring a global revolution in every sector of our lives today – technology and energy supply, communication and environmental concerns, society and religion. Is this what governments and corporations are afraid of – a shift in balance and their loss of their positions of power and control? Or is it that the powers that be are afraid of re-writing our human history?